Ever wondered why llamas hate dogs so much? 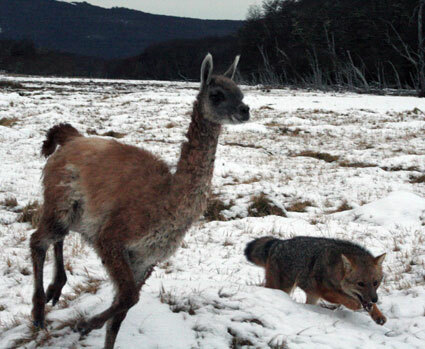 The animal on the right is a culpe0 (Lycalopex culpaeus) and the animal on the left is a guanaco (Lama guanicoe). Llamas are derived from guanacoes, though they do have some alpaca blood in them. Alpacas are derived from the vicuña (Vicugna vicugna). The wild South American camels evolved with canid predation. Culpeos and chillas (L. griseus) often try to attack their offspring. During the Pleistocene, these camels also suffered from predation from dire wolves. Because they have evolved with some much predation from canids, they have evolved a certain amount of antipathy toward anything that looks like a dog. This hatred is a great asset when one uses a llama to guard sheep from coyotes and stray dogs. It’s not so useful when the llamas won’t let the family dogs cross a pasture. The guanaco or (a very close relative to it) is the wild ancestor of the llama. I did call these foxes zorros. I personally like the Lycalopex genus name. It means wolf-fox in Greek, and that’s what they are. Not only do they look like coyotes, they are more closely related to wolves and coyotes than to true foxes. This particular species appears to be the chilla or “South American gray fox,” a name I refuse to use because Urocyon, my gray fox, is also found in South America. And the best offense is a good defense. So the domestic llama naturally hates the very idea of anything that looks like dog. That’s why they are so good at keeping coyotes out of flocks. They are dog haters from way back.